St Mary's Augustinian Priory stands on the site where St Mochta established a monastery in 528 CE. An Abbey was founded here in the late 1130s but was soon destroyed by fire. In 1148 Donough O'Carroll, King of Oriel established St Mary's Priory here. 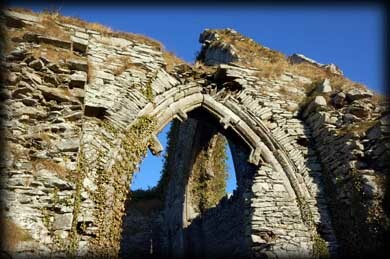 This priory was subsequently burned in 1152, 1160 and 1166. The remaining ruins probably date from the 13th century. In 1315 the Prior of Louth was fined £40, but pardoned, for entertaining scotsman Edward Bruce. 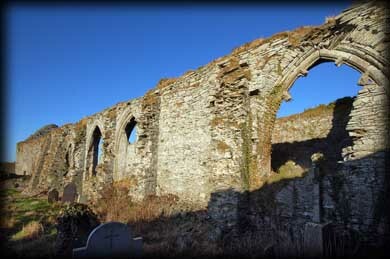 After the Suppression the Priory and some of the lands were granted to Oliver Plunkett, Baron of Louth. 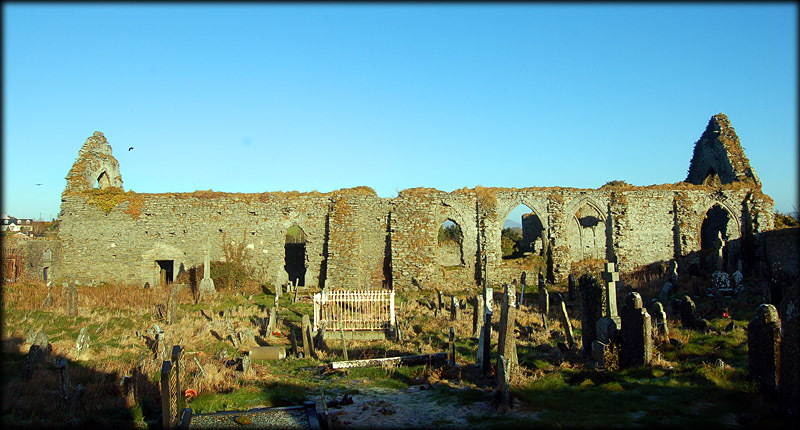 The impressive church is possibly the longest priory church in Ireland, being about 46m long. The south wall pictured above is original and shows evidence of tracery in all the windows, as does the east and west gables of the church. The north wall is not original and featureless. It is thought there may have been a central bell tower at some stage dividing the Nave from the Chancel, but there is scant evidence of it today. 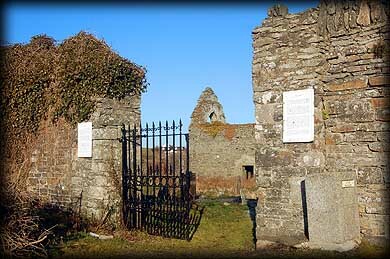 There are also some very interesting gravestones located in the Priory grounds and in the field next to it, is a stone roofed oratory known as St Mochta's House. You can drive right up to the Priory gate pictured below. I was blessed with good weather on this trip and will definitely call back here in the future. Situated: Very easy, St Mary's is located in the centre of Louth village. Discovery Map 36: H 9557 0144. Last visit Jan 2011.